This week it was reported that the Confederate flag, which was removed following the 2015 murder of nine parishioners during Bible study at Emanuel AME Church in Charleston, went on display at the South Carolina Confederate Relic Room and Military Museum. This would be good news, but for the fact that the display makes no reference to the events leading to its removal. Issues surrounding the eventual display of this flag surfaced after its removal from the State House in July 2015. The most pressing question was whether sufficient funds would be provided by the state to install an exhibit that told the complete story of the flag. The current display cost a meager $1,400. There is no question that the lack of funds is an issue here, but it strains credulity to suggest that nothing more could be done. At the least, two or three additional sentences that reference Dylann Roof, his goal of starting a race war, and a reference to the victims would not have significantly stretched their budget. Given the failure to notify the public that the flag was on display and the display itself it is clear that the museum staff hoped to avoid upsetting certain constituencies and controversy altogether. That is unfortunate. The result is not only a failure in their mission to educate the general public, but it is also a betrayal of the Charleston Nine. I’m beginning to think that every ‘historical’ artifact or relic needs a timeline in its display, showing what makes it historical. What lead to this artifact and to what did it lead. for example, iirc, the Gettysburg museum displayed ‘the table on which Jackson’s arm was amputated’, which leads to the question ‘why?’. Contrary to popular belief, artifacts don’t “speak for themselves.” They are silent, and unless the context or significance is presented, people are inclined to make up their own stories to fill the void. Yes, Hank, artifacts on display need historical context: why are they there, how were they used, etc. A sword hanging on the wall is just a sword. The sign should say what kind of sword, who manufactured it, how was it used. And, if it was George Washington’s, or RE Lee, or Lt. John Smith of the Umteenth Indiana Cavalry and Lt. Smith was at the following battles, etc., then that is important. 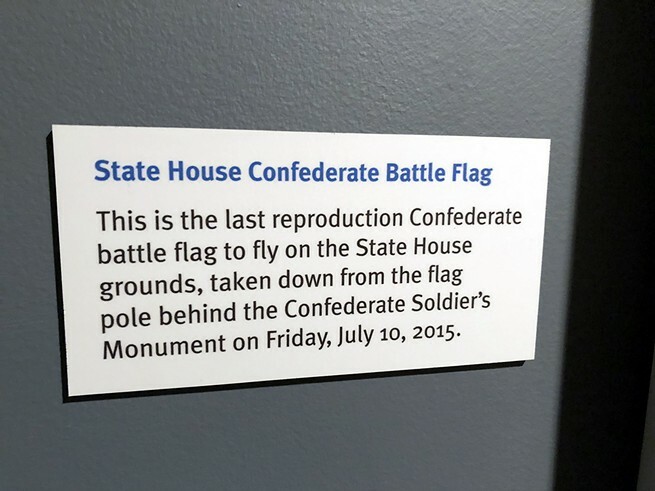 Here we have a flag that was removed from display, as the sign says, “This is the last reproduction Confederate battle flag to fly on the State House grounds, taken down from the pole behind the Confederate Soldier’s Monument on Friday, July 10, 2015.” But why was it removed? It makes a difference if the removal was because the flag pole needed to be moved – trivial, and not worth mentioning. Or, in this, removed because of the murder of nine South Carolinians – important and why they were murdered and who did it. And why is it now on display. Who gets to write the historical context? I can decide for myself. I can decide for myself. I work in this field. This was intentional and trying to pass it off on budgetary issues is pathetic. that beautiful flag should have never been taken down. it didn’t hurt anyone . Racist are those who hate the southern white men who are too dumb to realize the true history of slavery started with a black man in America.. I agree, it’s almost as rampant as real live unicorns. The Confederate flag is that and more. Saying that it is only a battle flag representing troops in the field is nothing more than a distraction that those soldiers fought to maintain and protect slavery, whether they wanted to or not. All of us with Confederate ancestors are stuck with that undeniable, historical, fact. Kind of sheds a different light on the subject and puts things in a more clear perspective, doesn’t it? And here’s the most important question I almost never see/hear anyone asking: Since the CSA/AoNV “Battle Flag” is a representation of a TREASONOUS INSURRECTION against the United States, why do so many INSIST on defending and PRAISING the historical actions and symbolisms of the Great Act of SEDITION against our Own Country that resulted in the greatest death toll of Americans in this Nation’s history, accounting for just shy of 70,000 more American lives lost than were lost in ALL OF OUR OTHER WARS & CONFLICTS (both Foreign and Domestic) COMBINED? One does not go to a place called the “Confederate Relic Room” for history; one goes there to show reverence. Changing the name of a National Park site usually involves Congress. So don’t hold your breath on that. “relic” is a strange word to use. No saints of any description fought for the Confederacu as far as I know. In the eyes of many (white) Southerners all the Confederates were saints, and many of them martyrs. “History is not history, unless it is the truth.” And that means ALL of it, not just the parts we like. The flag itself merely represents the right to political independence and self-government, and there is certainly no need to manufacture a false connection between it and a 21st century criminally insane individual. That would only distort its meaning. Besides that, Roof explicitly declared that he committed the murders because he was angry over the rate of black-on-white violent crime, not because he believed in the right of the people to alter and abolish their systems of government. We could say this if we wanted to ignore 150+ years of history. I concur. The ability to deny actual history and events always astounds me, especially when it comes at the expense of that history. No need at all. Roof and his murder of nine people, at prayer in their church, make the connection crystal clear.